Pressure Relief Valve Model 55L, UL Listed, FM approved, direct acting - precise pressure control, Positive dependable opening, Drip tight closure, No packing glands of stuffing boxes, Sensitive to small pressure variations. 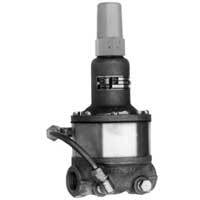 This valve is a direct-acting, spring loaded, diaphragm type relief valve. It may be installed in any position and will open and close within very close pressure limits. The valve is normally held closed by the force of the compression spring above the diaphragm. When the controlling pressure applied under the diaphragm exceeds the spring setting, the disc is lifted off its seat, permitting flow through the control. When control pressure drops below the spring sitting, the spring forces the control back to its normally closed position. The controlling pressure is applied to the chamber beneath the diaphragm through an external tube on the 55L STANDARD MATERIALS: Body & cover: Cast Bronze ASTM B62, Trim: Brass & Stainless steel 303, Rubber: Buna-N Synthetic rubber. Other materials are available upon request.